With a successful spacewalk behind them, Chinese astronautsare preparing to return home to Earth Sunday. Zhai Zhigang, Liu Boming and Jing Haipeng, the threecrewmembers of the Shenzhou 7 mission, China?s third manned spaceflight, areset to land Sunday at about 5:00 a.m. ET (0900 GMT). They are slated to land onthe grassy plains of Inner Mongolia aboard their craft?s reentrymodule, which is based on the Russian-built Soyuz spacecraft?s reentrymodule. After launchingThursday atop a Long March 2F rocket from Jiuquan Satellite Launch Centerin China's Gansu province, the Chinese astronauts, or taikonauts, accomplished amajor milestone in completing their country?s firstspacewalk. The roughly 20-minute excursion took Zhai outside the craftto retrieve a science experiment from the vehicle?s surface, with Liu assistingand coming part-way out of the hatch to hand Zhai supplies. The spacewalk demonstrated the capabilities of China?s astronauts,as well as the nation?s technological prowess, especially through the successfulperformance of a new, Chinese-builtspacesuit. The activity was broadcast live, signalingChina?s increasing willingness to be open with the public and press, as well asstrong confidence in its ability to complete the maneuver safely. 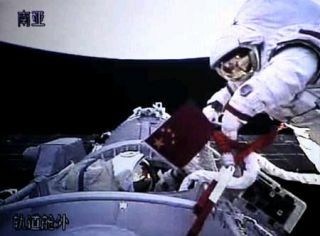 "Your success represents a new breakthrough in ourmanned space program," said Chinese president and Communist Party leaderHu Jintao after the spacewalk, according to the Associated Press. "The motherland and thepeople thank you." With the mission?s biggest hurdle behind them, thetaikonauts are spending the rest of their roughly 68-hour journey in spacepreparing for the return trip. Meals aboard the ship have included typicalChinese fare such as kung pao chicken, shrimp and dried fruit, the official stateXinhua news agency reported. Overall, the mission so far has been smooth for China,with no major reported glitches, and a safe and successful spacewalk completed. ?This sends the message that China is a space power of thefirst order,? Dean Cheng, China analyst with Alexandria, Va.-based think tankCNA Corp., told SPACE.com. ?They have the ability to do all sorts of thingsin space ? put people up, and if necessary, shoot down things,? he said,referring to China?s destruction of one of its own satellites with a missile inJanuary 2007. The Shenzhou7 mission is a step toward China?s larger goals of establishing a mannedspace laboratory, and perhaps eventually landing a person on the moon. Thenation is the third country, after Russia and the United States, to independentlylaunch astronauts into space.